>The egg is an important product of poultry farming. The overall growth of the poultry farming is to achieve the best performance, feed utilization and health of layer birds. For this, there is a need for the adequate level of fats, carbohydrates, minerals, vitamins which increase the efficiency of production and health. The correct availability of trace minerals which is a mix of micro and macro nutrients are essential for the better health and growth of the body. These nutrients are needed for the optimum production of eggs in the layer birds. When there is a low level of nutrients in the body it lowers the production of egg and decreases the overall health of the body. To increase the health we use layer feed premix for better health. To recover from low production of eggs there is a need for egg enhancer supplement for layers which helps in increasing the production of eggs and also promotes better health and growth of the body. 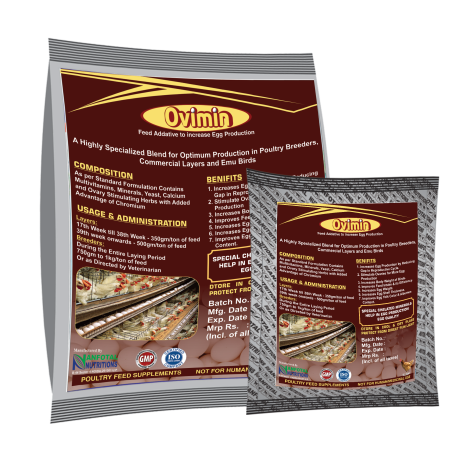 “Ovimin” is one of the best supplement which helps in increasing the production of eggs. It contains vital elements like multivitamins, calcium, yeast and ovary-stimulating herbs which helps in better production of eggs. Other than producing eggs it also improves the quality of the eggs produced. Boost the production of eggs . Ovary Stimulating herbs stimulates for better egg production. Improves the body weight and improves feed intake efficiency . Enhances the Egg quality and its weight. Improves the thickness of eggshells and stop production of thin egg shells. . Improves the egg yolk color and content of albumen. 17th week to 38th week: 500gm/ton of feed . 39th week onwards: - 350gm/ton of feed. Or, as directed by veterinarian consultant.